Reposting from my very first month of Pondering Principles back in August 2008. When people say that there are no principled men in government, I must disagree. There are men and women who are living their principles in public life. One of the men I respect most is Supreme Court Justice Clarence Thomas. 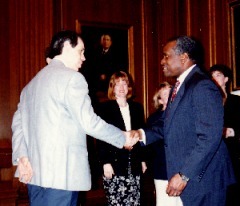 For the record, Justice Thomas does not know me personally and would not recognize me if introduced. I did meet him twice–once at the Supreme Court when the government school at Regent University took students there in 1995, and again a few years later when he came to the Regent campus to speak. As a faculty sponsor for the Federalist Society, I did once again greet him at a reception. But I have read his recent book, an autobiography entitled My Grandfather’s Son. Once I began the book, I could hardly put it down. 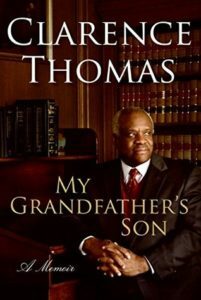 The story he tells–of his childhood in poverty, his anger over racism as a young man, his return to the Christian faith in his later years, and the trials of his Senate confirmation hearings–is riveting. It shows, to me, how God will use everything in a person’s life to shape and prepare that individual for a calling in this world. Thomas has been attacked by many people because he espouses a view of the Constitution that says you don’t ignore the limitations that the document places on the authority of the federal government. But in taking the stance that he does, he is abiding by principle. Yes, principled people are in the minority, but they do exist. Rather than promoting cynicism about government, we should be sharing the stories of those who try to apply Biblical principles such as the rule of law to society.